Our first bag of coffee will be our last. We’re getting out of the coffee business – but it wasn’t entirely our choice. Two other people had a dramatic impact on our coffee future. Patrick decided that he would tear out the coffee plants on our property without asking. Well, okay, technically he asked the caretaker who was around for seven years. The caretaker told Patrick that the coffee was not on our property. Luckily, Nancy was here, knew the property lines and stopped him before he destroyed every single mature coffee plant. Patrick promised he would replace the coffee at his expense. He stalled long enough that now the only plants available to purchase are very young immature coffee plants – and we are entering the dry season. Coffee takes 4-5 years of careful cultivation before producing beans. We have now agreed that we will be in the citrus fruit business. We told Patrick to plant some citrus trees among the remaining coffee plants. Oranges, lemons, tangerines, grapefruit are much better for a person in the long run. The other reason we are getting out of the coffee business is Edgar. Edgar is the caretaker that raised and harvested our coffee. He is leaving and won’t be around to grow the young plants into producers. Raising coffee is a hard, hot, dirty, and dangerous job. So our first bag of coffee will be our last. 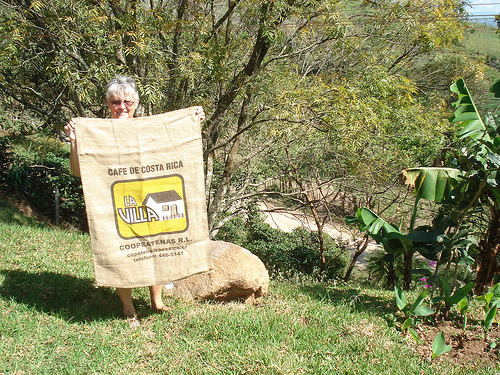 Nancy will be working her magic on the coffee bag in the picture as a souvenir of our first – and last year – as coffee producers. We will remain coffee consumers, but no longer will our beans have a chance of being in your double-tall, lo-fat, grande, mocha frap. Look for us in a few years at your local Jamba Juice bar. That bag will make a great dress. It just needs two arm holes, a head hole and a rope belt. Very true! Surely a hit for New Year’s Eve doncha think?